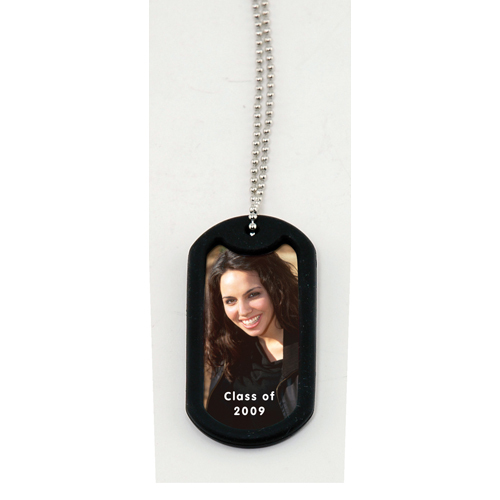 Etched Dog Tag features: * Etched imprint on one side of aluminum dogtag. 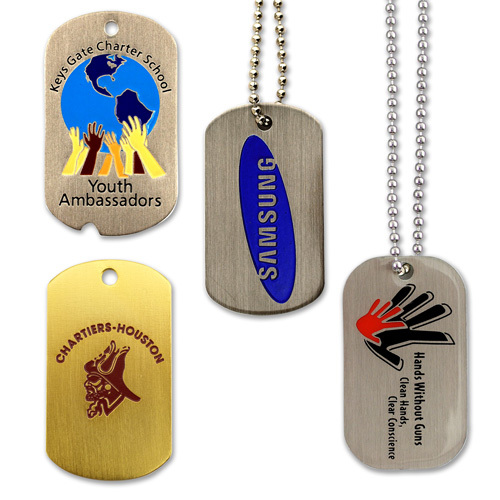 * Includes one color imprint on aluminum or silver imprint on colored metal. * Includes 24" bead chain. Other bead chain lengths and attachments for dogtags available. * Metal colors: black, red, green, royal blue, navy blue, pink, purple, yellow, others available. * Second side imprint available, call for details. * Fast four week delivery. Rush service available. 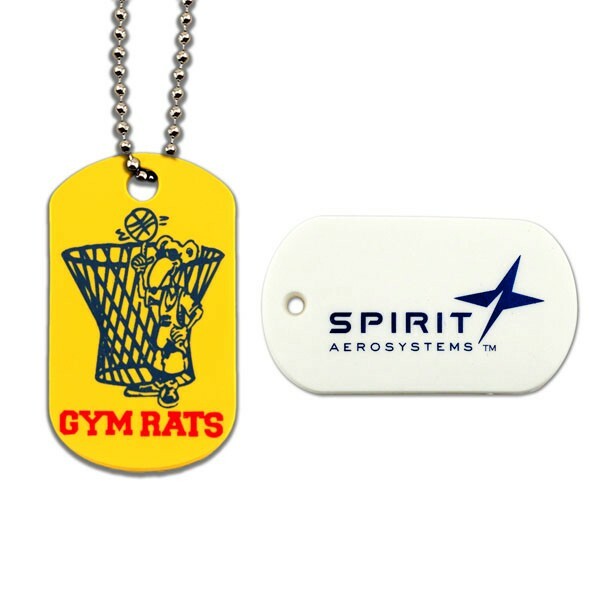 This single sided dog tag pendant comes with a cell phone charm attachment. 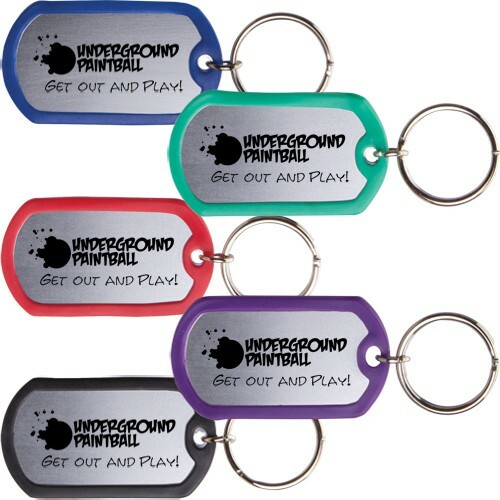 Our custom Dog Tag cell phone charms are lightweight and have no metal or aluminum and a 1.2” x 2” full color domed imprint. They can also be produced with a translucent imprint effect. 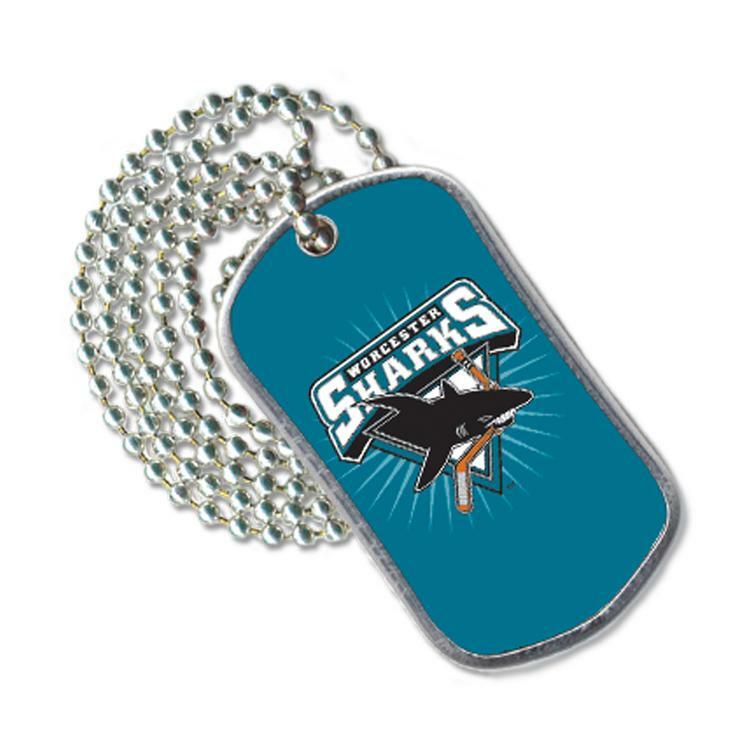 Excellent as a novelty souvenir cell phone charm pendant for special events, trade shows gifts, fund raising or military promotions. Pricing includes our professional “Executive Style Packaging®” and custom packaging options are available starting as low as 100 units to provide additional marketing impact. 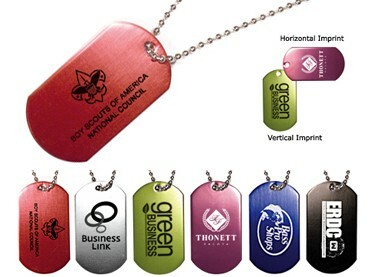 SpectraFlex® Dog Tag Features: • Colorful, durable, flexible...You gotta feel this! * Non-toxic PVC with unique,pliable rubber-like texture. 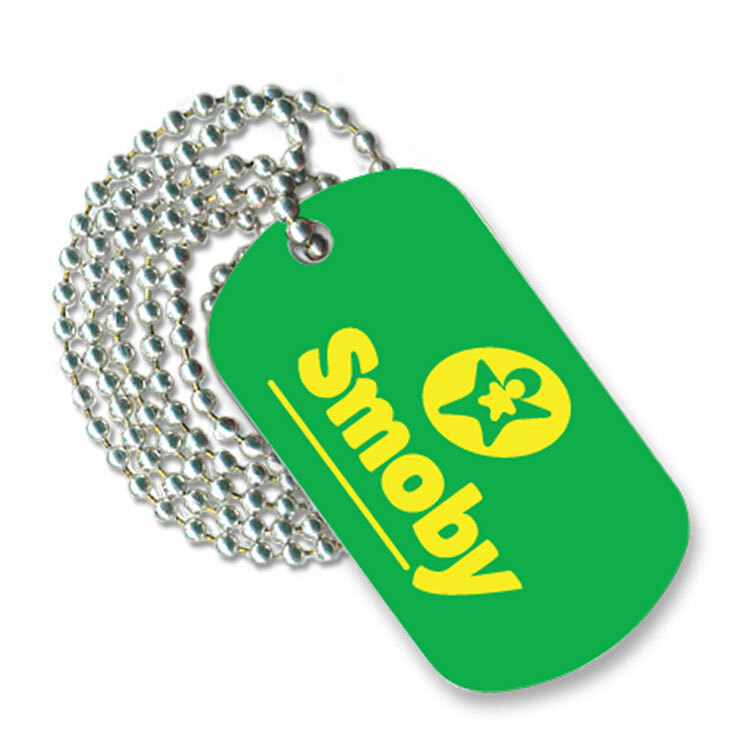 * Includes screened imprint on one side of dogtag. 2-D molded imprint available. • One silk-screened color included with FREE PMS color match. 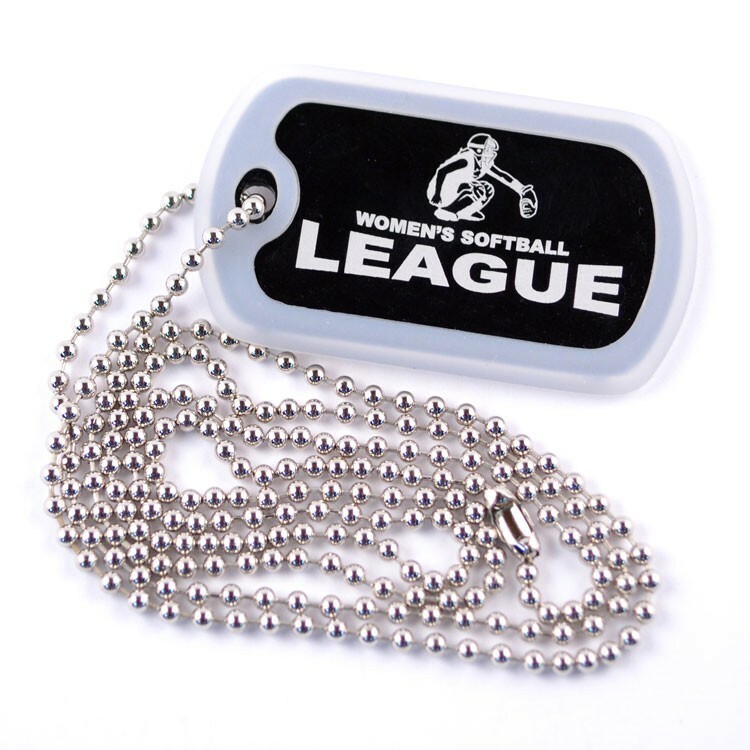 * Call for information on bead chain and key ring attachments. 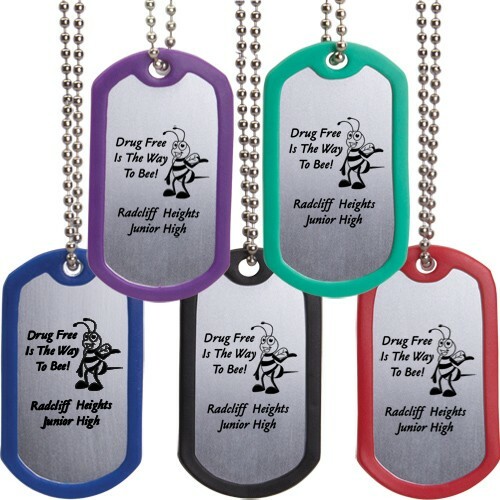 Full color Dog Tag features: * Four color process imprint on one side of aluminum dogtag. * Includes 24" bead chain. Other bead chain lengths and attachments for dogtags available. * Second side imprint available, call for details. * Fast four week delivery, rush service available. 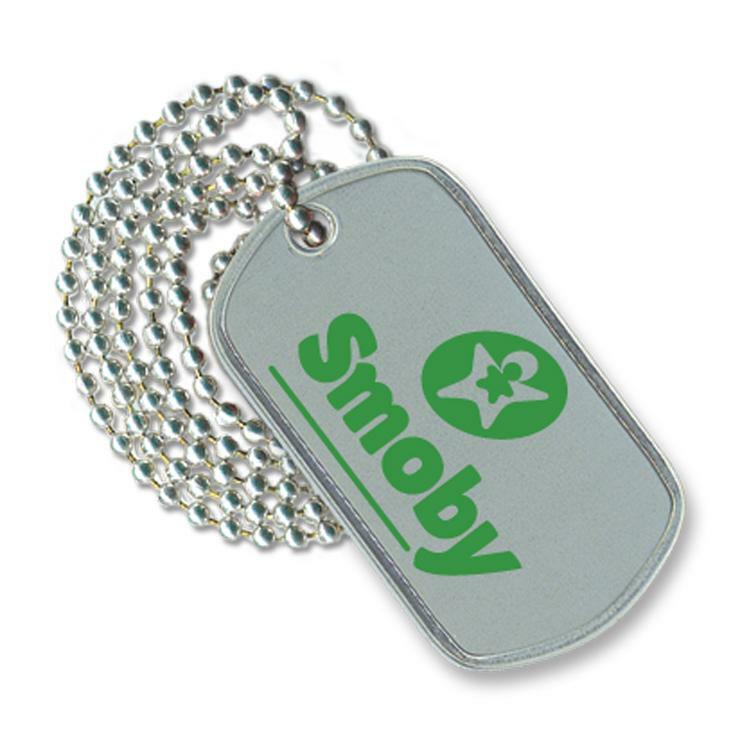 Etched Dog Tag features: * Etched imprint on one side of stainless steel dogtag. 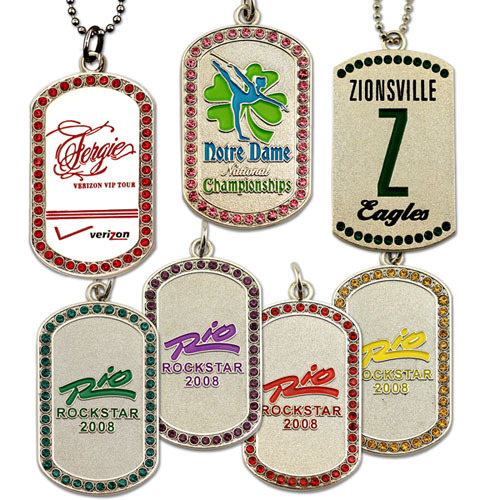 * Includes one color imprint on aluminum or silver imprint on colored metal. * Includes 24" bead chain. Other bead chain lengths and attachments for dogtags available. 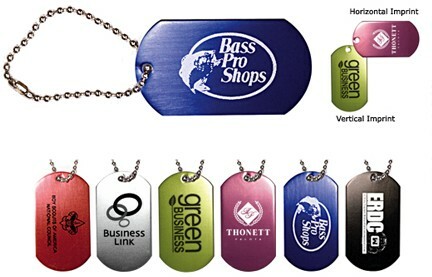 * Metal colors: black, red, green, royal blue, navy blue, pink, purple, yellow, others available. * Second side imprint available, call for details. * Fast four week delivery. Rush service available. 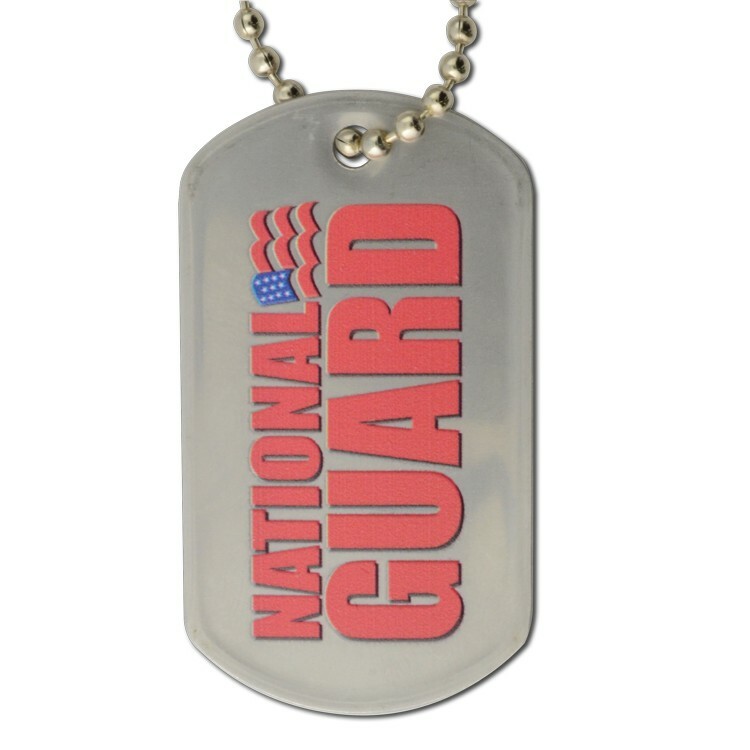 "Iced-Out" Dog Tag features: * Cast dogtag with nickel plating and synthetic jeweled border decoration. * Includes 24" bead chain. Other bead chain lengths and attachments for dogtags available. * Includes 2 soft enamel colors and 44 synthetic jewels in border. * Jewel colors: Clear, blue, green, red and yellow. * Fast four week production. Rush service available. 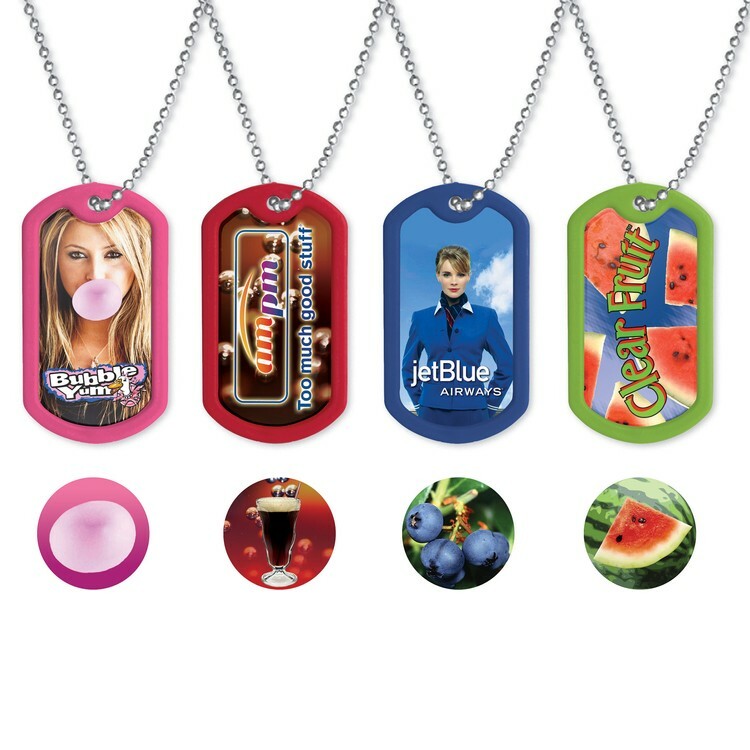 USA Heaven Scent™ Dog Tags Four-Color Process VibraColor UV-Coated Label! 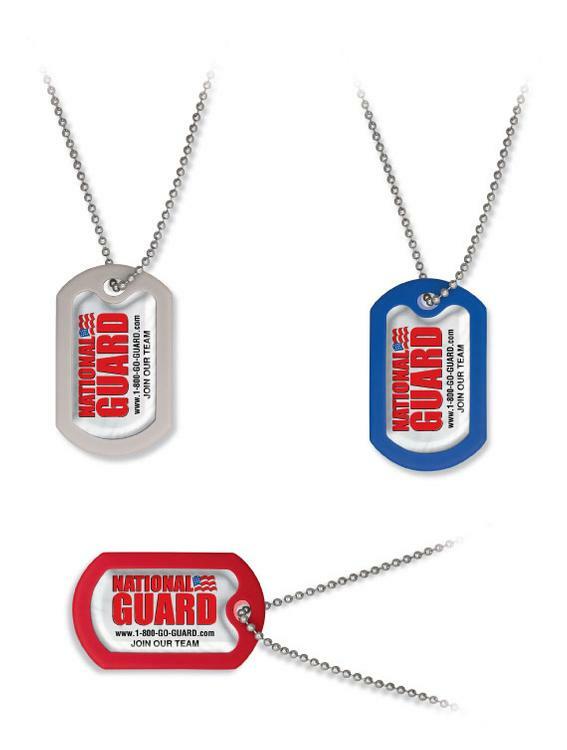 USA-made wearable plastic dog tag with ball chain Fun, memorable Heaven Scent™ aromas built in! 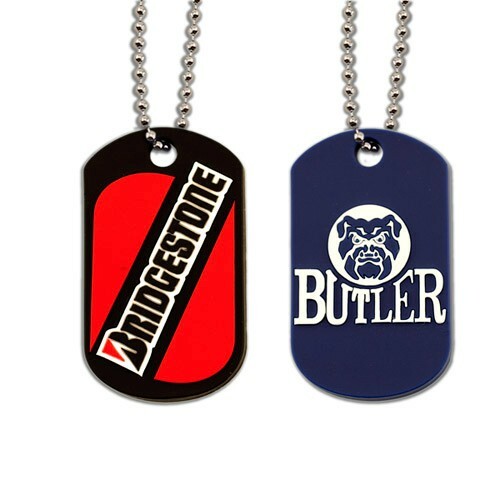 This double sided dog tag pendant comes with a cell phone charm attachment. 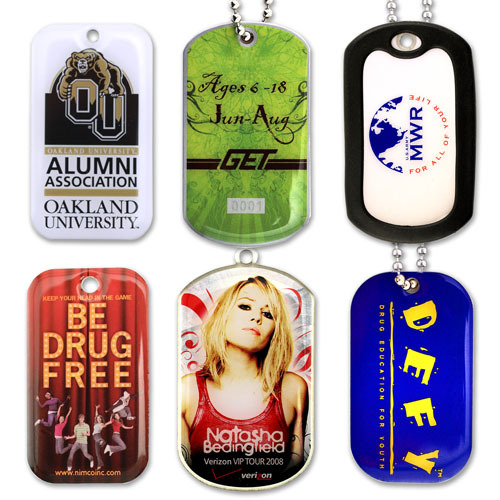 Our custom Dog Tag cell phone charms are lightweight and have no metal or aluminum and a 1.2” x 2” full color domed imprint. They can also be produced with a translucent imprint effect. 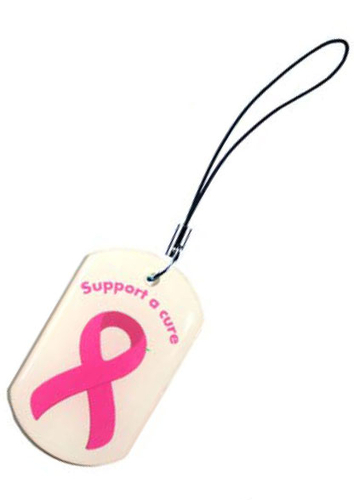 Excellent as a novelty souvenir cell phone charm pendant for special events, trade shows gifts, fund raising or military promotions. Pricing includes our professional “Executive Style Packaging®” and custom packaging options are available starting as low as 100 units to provide additional marketing impact.